When I first thought of a business idea many years ago, I brushed it aside. I can't afford to think about it, I thought. If it didn't succeed, I would have lost time, money, resources, dignity, promotion potential, and who knew what else. What I didn't realize is that not trying actually was digging the hole much deeper. 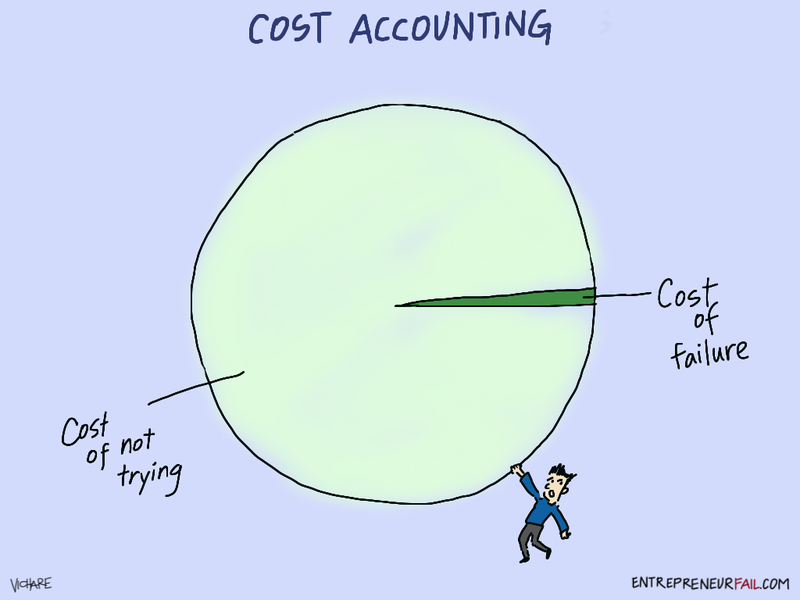 If you are worried about the cost of failure, you're solving the wrong accounting problem. Even though many flirt with the idea of starting a business, it is often too intimidating. As Seth Godin said, "The tiny cost of failure... is dwarfed by the huge cost of not trying. This is news, a state of affairs due to the significant value of connection, to the power of ideas that spread and to the low cost of production. Delighting a few with an idea worth spreading, is more valuable than ever before." So start trying. It's the penny-wise thing to do. Let us know if you were scared to fail in the comments below. Yes, let's try and risk MORE! I really like your comics and posts. Thanks a lot for your inspiration.